Bring back up with you with this special bundle that includes 2 tactical M27 spring pistols. Featuring a utilitarian but sleek design, each pistol is molded to fit into a palm of your hand and features slide serrations for a sure grip with each pull. The safety switch can be flicked on and off and while the gun can be armed by manually pulling the slide back before each shot. A unique feature of this pistol is when you have fired off every round of its 24-round magazine is its slide-lock feature. Once the pistol is out of rounds, the slide will lock back to the rear position until it is reloaded. Once reloaded, simply flick the slide release and the pistol will reset its slide to its normal position and ready to fire again. 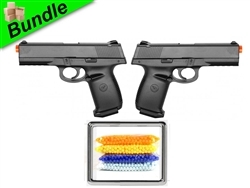 These tactical pistols fire at an impressive 270 FPS and as part of this package includes an additional bonus 5000 rounds of quality 0.12g BBs so the fun never has to end.